Frac Oil Field Storage Tanks are the perfect solution for short term liquid storage of frac water, oil field storage, fuel, and other production fluids. Built with several high resistance materials (such as 32 or 34 ounce military-grade urethane), these tanks are equipped for bulk capacity liquid storage both before and after a frac operation. This hydraulic frac tank is designed to offer a flexible alternative to the standard steel storage unit. While standard steel fracking tanks can store around 400-600 BBL, the flexible frac unit can store as much as 210,000 gallons in a single storage unit. For site projects or requirements, this can greatly reduce the amount of tanks needed for a single frac project. 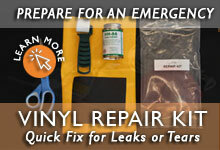 This can lower your shipping costs and reduce setup and installation times. Questions? We can help! Call us at +1-772-646-0597 or request a quote to discuss your project. 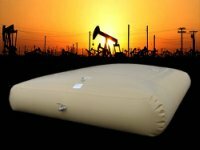 Tank Fabric: The materials used for these frac tanks oil storage products typically consists of a 32 ounce or 34 ounce urethane materials that is lined with a material suitable for either potable water, non-potable water, fuel, or hydrocarbons. Typically tanks are built to match the material you are intended to store, allowing tanks to be equipped for the nature of your materials. Other liners are available to best meet your liquid storage requirements. Fittings: Flexible tanks can be built with multiple different fittings including fill/discharge ports, floor drain ports, hoses, and vents. The standard tanks comes with the following fittings shown below, however specifications fittings can also be added to your tank to best meet your area conditions. Capacities: The collapsible fracking tanks can be made in capacities up to 210,000 gallons. When used in a hydraulic fracturing operation, this has dramatically decreased the number of tanks required for operations. For example, a 150,000 gallon flexible tank holds up 3750 US oil barrels which is equivalent to approximately 6 conventional steel frac tanks. 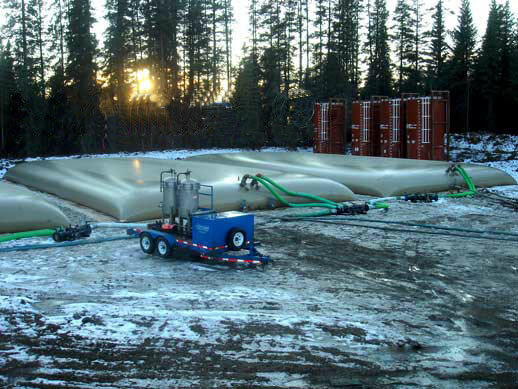 Secondary Containment: It is typically recommended that regardless of your tank capacity, these units should be equipped with a secondary containment berm or tank liner. This adds an extra layer of protection between your tank bottom and the ground, helping to increase security and containment around your tank. View the Frac Tank Product Page.